Beyond HELLO: A Sunday with Purpose – Beyond H.E.L.L.O. Changing the Perception of Homelessness One Story at a Time. If you drive down East Hastings Street on an ordinary day, you can look out your car window and see the faces of people who have lost their purpose: lost souls, who have traded away hope in exchange for darkness. Today was different. East Hastings was alive, and purpose was abundant. As we arrived just after 12:30 PM, the streets were flooded with activity. 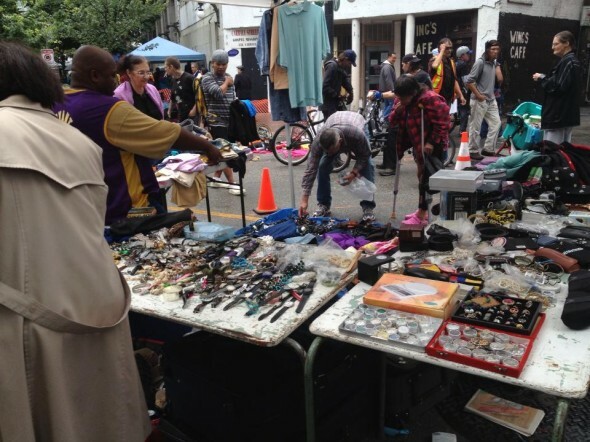 Church groups handed out meals, the local bottle depot managed the crowds awaiting payment, movie extra’s roamed the streets as a back drop for a new film and the Downtown Eastside Sunday Street Market was in full swing. It seemed everyone had a purpose, or at least something to occupy their time. I too had a purpose, yet today was different than previous months. Today my plan was to make not one, but two new friends. You see, usually I travel to the Downtown Eastside with family, friends or students and invite residents of the Downtown Eastside community to participate in Project HELLO or Beyond HELLO. I then share the stories through my blog. Last month, a lady named Donna contacted me after reading my blog post through a link a mutual friend had shared. She asked if I would go ‘Beyond HELLO’. She would pay for lunch, in exchange for the opportunity to have conversation – with each other – and hopefully with someone living in the Downtown Eastside. I agreed. As Donna and I drove, we went ‘Beyond HELLO’. We talked about family, health, spirituality, intuition and our life experiences. The conversation went well beyond the surface level conversations that usually occur when you first meet someone. Instead we spoke about connections that exist between all people and the opportunities we have to act in ways of significance. We spoke of the importance of listening to our inner voices, and taking time to Be. By the time we reached the Downtown Eastside, we had formed a connection based on mutual respect and understanding. As we searched for a parking spot, I spotted Sandra Bonneau, the woman who I believe is the heart of the Downtown Eastside. She has survived the streets for over 20 years, has struggled with addiction, abuse and health complications yet her spirit shines. Like always, she greeted me with her toothless smile and sparkling eyes. She was excited to hear that the group of high school students who found her daughter for her five years ago would all be in town for Christmas. I let her know that they would be back from university and wanted to wish her a happy birthday on December 22nd. We agreed to meet up and I offered to bring a birthday cake. I asked if there was anything she needed as a birthday gift. She replied saying ‘just your presence’. I smiled and offered her lunch. She smiled back, knowing others needed our offer more than she did, so she politely declined and we parted ways. We wandered through the street market, marvelling at the collection of stolen goods being sold in an open market place. We considered offering lunch to some of the men who passed by with their life’s belongings in shopping carts – but we didn’t – as we both knew they would refuse. Leaving their carts unattended would be too substantial a risk in this neighbourhood. We wandered back up Hastings and offered lunch to a few others who looked like they could use a meal. Each refused. At one point Donna wondered if perhaps today was just about the two of us going ‘Beyond HELLO’. It felt as though it was. We decided to stand at a busy corner on Hastings and let others approach us. Being still in their neighbourhood seems to be a less invasive approach. Within minutes we had a lady hoping to help me find Garth (Beyond HELLO – August) and another woman in a wheel chair who recognized me and wanted to let me know about her daughter and the special visit she had with her grandson. To be honest, I didn’t recognize her. Have we helped her before? I’m not sure. She thought so, so I stopped and we had a nice chat. As we began to wonder if anyone wanted lunch, a lady passed by approaching the crosswalk. Her hair was tangled and slept on, her clothing reflected warmth more than style, and her eyes were guarded. Our eyes met for a second, like she was scanning the neighbourhood to make sure it was safe. She walked by, but then, turned back and looked at us over her shoulder. I don’t remember who spoke first, but I know her eyes changed, and she looked at us with curiosity and perhaps trust. We asked if she was hungry. She said yes – in fact that’s why she was out from her BC Housing shelter. She was hoping to find a warm meal. Together the three of us walked towards the Save On Meats diner. As we walked towards the diner, we walked like three friends. Shelley introduced herself and made sure she learned our names quickly. As we entered the diner, she commented on how nice it was – and mentioned it might be a nice spot to bring her boyfriend for his birthday on New Year’s Eve. As we approached the counter – the waitress explained that we could take an order form and create our own breakfast meal, salad, sandwich or burger. Shelley suggested we take the forms to the table to sit down together and then decide. Not wanting to ask if she was literate, I read the menu choices out loud and together we discussed what we should eat. Shelley thought about a sandwich – and referenced her need to be healthy – briefly reflecting on her time years ago when she worked as an aerobics instructor in Toronto. She thought a sandwich would be nice – but when I started to ask her about the different bread options or toppings you could see the decision was too overwhelming. Between her addiction to crack, methadone use and recovery from being struck by a van last year, she struggles to stay with one thought for more than a minute at a time. Through our conversation you could see her eyes literally fade in and out of awareness. In some moments it looked as if she needed to sleep – in others she was alive, present and willing to share with us. Perhaps because of the perplexity of the order form, or perhaps because the smell of burgers and fries surrounded us, Shelley changed her mind from the sandwich form and said she would rather have a burger and fries. Donna agreed and ordered the same. Shelley asked if I would have a burger too. I explained that I needed to order a salad as I am 1/2 way through a 12 day cleanse with a friend at work therefore I cannot eat burgers or fries. As the words left my mouth I recognized how shallow it seemed – here I was – explaining to a lady who searches the streets for food – why I am only eating certain foods to detoxify my body. And yet I also felt it was human to share. She smiled and I laughed and said “it’s crazy – the things women will do!” She agreed and let me know she would put the ketchup and mustard on her burger herself. She then winked and said that was one of her secrets for staying thin. The waitress arrived with coffee. Shelley’s cup had an inch of space at the top for cream or sugar. Shelley let the sugar pour. Intentionally – enough that the cup started to overfill. She mumbled about the cup being too full and stirred her new concoction – 3/4 coffee, 1/4 sugar. As she tried to steady her shaking hand the coffee spilled. Donna and I wiped it up as she drank – and eventually helped by pouring some out into a water glass. Shelley shared her life story – growing up with a military police father – where she was never sure if she should get closer or further away. She didn’t connect with her mom and ran away from home a couple times but was always welcome back by her dad. Her mom decided to grow distant from her father while she decided to get closer. When her dad died from cancer twenty five years ago she was devastated and turned to crack. As a server in bars, she made her way across the country eventually finding her way to the Downtown Eastside. She fell in love but lost her partner to cancer as well. Yet – despite the drug addiction and pain she continually referenced her mantra of staying positive and not looking back. I asked what that was about – she answered with clarity. For Shelley it was about god – and staying true to her faith. She then turned to us with certainty and said – you need to remember you are not where you are at just because of him – promise me you will give yourself credit too. We smiled. Shelley ate her burger and fries with urgency. Between bites she would pause for a split second and ask what else we would like to know. She had questions about her current relationship and wanted our advice. Her boyfriend wants her to move in with her – and has even discussed marriage – but something is holding her back. When I asked if he was the one she laughed. Donna asked if he was the one for now – and she smiled saying he was a good man who really loved her. She talked about her own behaviours, commenting that many would leave – but he chooses to stay. She then took time to ask us if we were married and how me met our spouses. Fading in and out of conversation, Shelley seemed to be hit with a burst of consciousness – and she raised her coffee cup in the air and offered a toast “to happiness, Christmas, and meeting new people.” Together we clanked our glasses, smiled and enjoyed each others company. 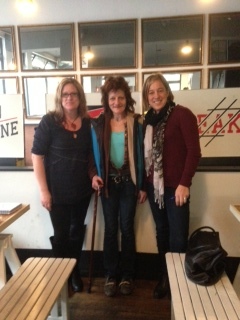 I ended with a usual question, asking Shelley what she wanted others to know about the Downtown Eastside neighbourhood. She answered with this: “It’s changing. And what it’s missing is a place to talk. A place to clear your head and talk through problems. A place to feel safe and have real conversations.” We smiled knowing exactly what she was trying to say. As Shelley stood up to leave, she turned back and asked each of us for a hug. We then had a group photo and promised to send a copy in the mail. Shelley left to meet up with her boyfriend, Donna and I drove home, all of us knowing we had just gone Beyond HELLO and experienced a Sunday with purpose.